Ceramic foam filter is the third generation of filter material after fiberglass mesh, honeycomb ceramic filter. With its three-dimensional structure, it has excellent filtering functions of screen, filtering, residuum collection and adsorption in filtering molten metal liquid. It has good chemical stability and does not react with alloy liquid, effectively remove the inclusion in the metal liquid to improve the purity of molten metal. It can make casting surface smooth, increase strength, reduce the rejection rate, and reduce energy consumption, improve labor productivity, reduce costs. 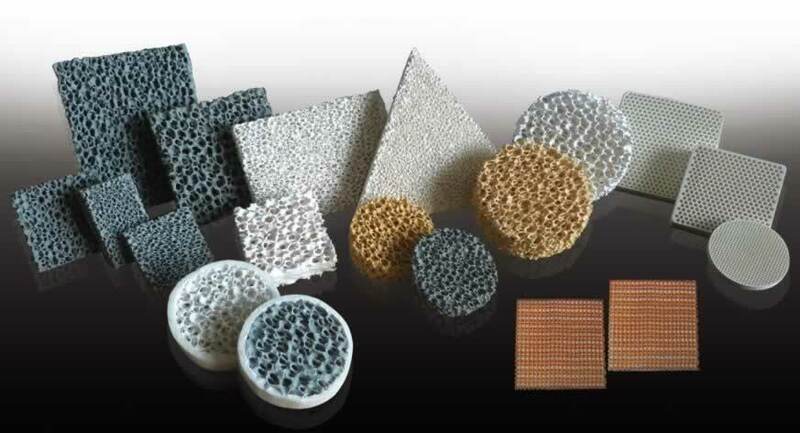 The ceramic foam filter is not only applied for metal filtering in high temperature, but high temperature gas treatment, carrier of catalyzer , solid heat exchanger and special filling for chemical industry. ●Mechanical block: remove large non-metallic inclusions. ●Filtering effect: filter small non-metallic inclusions. ●Deep adherence: adhere little inclusions. ●Reduce turbulence, provide laminar flow, avoid whirlpool. ●Trap gas that enter the mold cavity, relax impact, and decrease drop sand. The size are available in square, round and custom geometric shapes; sizes ranging from 10mm up to 500mm, and thicknesses from 10-50mm. The most common porosities are 10PPI, 15PPI, 20PPI, 25PPI,30PPI,40PPI.